A graduate of the University’s Ph.D. program in organizational behavior, Khurana has spent the past decade and a half across the river at Harvard Business School (HBS). His years in a professional school, in fact, helped convince him of the power of a liberal-arts education. As an example, he describes how students from preprofessional and liberal-arts backgrounds tackled case-study discussions, which often dealt with tricky questions of leadership and management. Over the years, he saw a “vast difference” in students’ abilities “to think about problems creatively, to locate a situation in a cultural context—to see the economics of that situation, but also the anthropology and the sociology,” he explains. 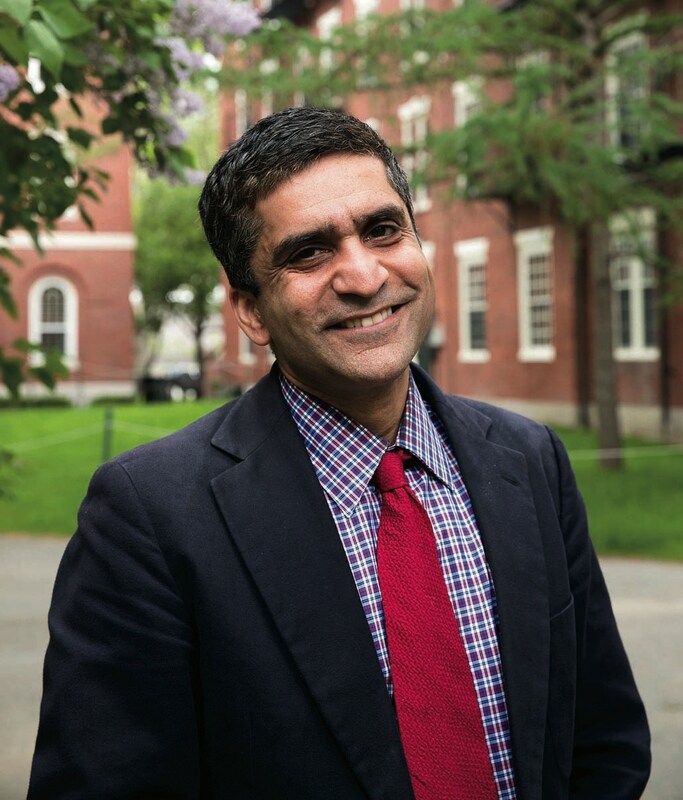 Even when based at HBS, therefore, Khurana kept the undergraduate experience close at hand: he served as a nonresident tutor in Eliot House while in graduate school, and he and his wife, Stephanie, became master and co-master of Cabot House in 2010. His role in the review of the General Education program, a five-year-old system of requirements for College students, exemplifies the link he sees between the intellectual and personal transformations central to the Harvard experience (see “Tough Grading for Gen Ed,” in this issue). In April, shortly before the release of the Gen Ed review committee’s relatively harsh five-year report, Khurana and dean of undergraduate education Jay Harris held the first of a series of faculty town-hall meetings to discuss the College curriculum. What he heard there, he says, was a “consensus”: that the College should help students develop a system for intellectual engagement, and that more meaningful interactions between faculty members and students is the best way to do so. Both groups have recalled such meetings—in which faculty members shared their stories, and students found mentors—as central to their Harvard experience. “My role is WD-40,” Khurana says: helping facilitate these interactions and thereby break down those divisions to create one College community.